I know several teachers that like to use Smart Notebook files with their students to share information, lessons and links. With the Smart Notebook Express online application, your students don't need to have the Smart Notebook software to view, interact with, and even edit a Smart Notebook file. Now your students can even use Smart Notebook files at home or on Netbooks. 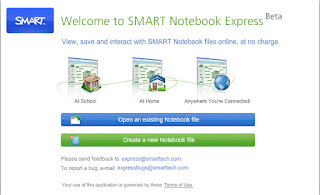 Just open the Smart Notebook Express website and open your saved file from the computer or flash drive. Students and teachers can even create Smart Notebook files (with a limited selection of basic tools).